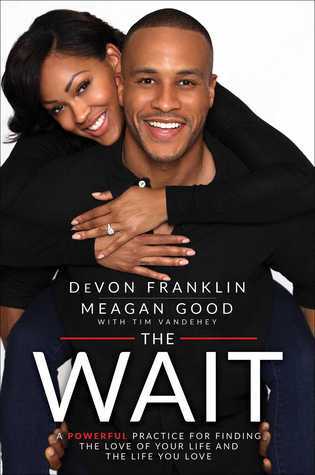 For all y’all looking for a new boo this new year, The Wait: A Powerful Practice to Finding the Love of Your Life and the Life you Love by the cutest couple, DeVon and Meagan Good Franklin, is the book you should read! The Wait is set to be released in February, and I’m telling you now, get your highlighters and sticky notes ready because there are so many lessons in this book that will make you sit all the way down and rethink your existence. Seriously. Even though this book is marketed towards the singles, boo’d up folks can learn a lil’ something and appreciate this book too. In addition to relationships, this book can help you in other areas of your life, like your career and friendships. The quick rundown: This cute couple gives us all lessons and encouragement on waiting for marriage to give ourselves physically to our mates. Yes, it’s about practicing celibacy, y’all, which in today’s culture, isn’t something that is often discussed or celebrated. The couple breaks it all the way down for us. For instance, they discuss why celibacy is important and the difference between abstinence and celibacy; how to cope with opposition while being celibate and keeping yourself busy during that time; and, how to successfully date while being celibate. The list goes on. This book is really like a celibacy bible. The writing is easy to read and understand. If you’re looking for a new love, and what you’ve done in the past obviously didn’t work out, give this book a try. As noted, DeVon and Meagan drop lots of knowledge about celibacy and getting your dating life together, especially if you are trying to find the One. What I appreciated from this book is both DeVon and Meagan talking to us from their own voices and telling us how they felt during their celibate dating process. We readers get to read the real, and you realize that you aren’t alone. They’ve both been through some things but made the committment to themselves to get right, which lead them to finding each other. Getting right meant being celibate and listening to God. Speaking of which, this book is Christian focused. DeVon is a minister so you should expect that, and Meags (that’s what I call her, hey girl!) is a Christian as well. I liked that aspect because while following The Wait, you’re gonna need something stronger than yourself, whatever your religion or belief, to keep you focused. Furthermore, this book can help you get your career (and friendships) together. As with relationships, we often have in our minds of how we want our jobs to be, and become upset when it isn’t. That’s because we need to look outside of that. Often, the person, career, or friend we need can be different from what’s on our list. Listen, I’m a follower of write what you want down and make it happen. However, one thing I have learned is we have to ask for what is best for us, what we really need to add to our happiness, instead of asking and looking for what we think we want or will make us happy. Yes, there is a difference. Y’all know y’all got that list: that person has to be this tall and look like Denzel if you like menz or Beyonce if you like womenz, make millions, and have a six pack; or that job must provide me access to a company jet and millions in salary, which is all nice. Trust me, I’ve gotten things a time or two, thinking it was what I wanted and believed it was sent from God, only to realize it was sent straight from hell! What looks good or what we think we want may not be what we need. As they said in the book, we can have our ideas and wants, and that’s great and all, but we have to look at the essence and qualities of that person or thing and not rely solely on a list. The Universe could be sending you something or someone you never considered before. I’mma stop preaching now. So, begin your 2016 with this book. I can’t say enough how much I enjoyed and learned from this book. I recommend all young folks to read it. Go on, preorder it now! Just look how cute they are on the cover! Practicing celibacy can save you a headache. Readers can also apply the lessons and advice from the book towards other areas in their lives. That’s always great! I was given an advanced copy from Netgally.